WASHINGTON — Respect Life Month is observed every October by the church in the United States, beginning with Respect Life Sunday, which takes place this year Oct. 1. These events kick off the 2017-18 Respect Life Program. The theme for the coming year is “Be Not Afraid” and will be in effect through September 2018. New materials are produced each year to help Catholics understand, value and become engaged with supporting the God-given dignity of every person. 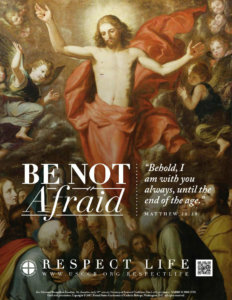 The Respect Life Program materials — available at http://bit.ly/ZO9Tp3 — are intended to help leaders integrate respect for human life into their work or ministry, according to the U.S. Conference of Catholic Bishops’ Secretariat of Pro-Life Activities. Also, action ideas and suggestions found in the customized leaders’ toolkit are provided throughout the resource guide and online, but the secretariat invites anyone to build off or adapt what is offered. For example, “9 Days for Life: Leaders’ Guide” was originally created for use in youth or young adult ministries. However, many of the suggestions are adaptable for other age ranges. Similarly, specific suggestions are written for teachers, but someone in another field may find the same idea useful for their area of expertise. Separate toolkits are available for priests and deacons, parishes, Catholic educators, Respect Life ministries, youth ministries, young adult ministries, faith formation and the Catholic press. Brochures, in either language, are 40 cents each, making it easier to buy in bulk for parishes and organizations. They can be ordered online at http://store.usccb.org/category-s/2211.htm, by phone at (866) 582-0943, by fax at (301) 779-8596, or by mail to USCCB Secretariat of Pro-Life-Activities, c/o Distribution Center, 3570 Bladensburg Rd., Brentwood, MD 20722. Materials for previous years of the Respect Life Program, dating back to the 2011-12 program, can still be ordered online. Parishes may copy a printable version of the new brochures at no cost, provided such reprints are distributed without charge and under the condition that each page is reproduced in its entirety without any alteration or change beyond adjustment in size. Homily notes and suggestions for general intercessions for use at Mass are also available online, as are fliers, bulletin covers and reproducible images bearing the new theme and logo of the Respect Life Program.